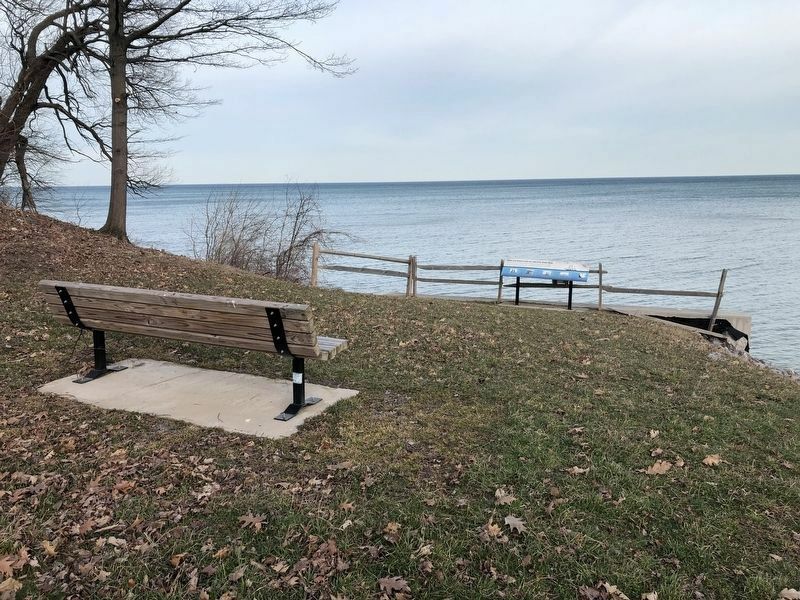 In the early 1800s, commercial shipping and fishing were important to the growth of the communities near Lake Erie State Park. The harbors at Barcelona and Dunkirk developed in the early 1800s as ships plying the Great Lakes docked to load and unload cargoes of wheat, coal, and timber. By mid-century, however, growing competition from railroads pulled much of the commercial traffic away from these smaller harbors. During the heyday of shipping on Lake Erie, there were many mishaps and shipwrecks in the waters off Lake Erie State Park. As many as 80 such instances are recorded. Many were relatively minor, while others ended in significant loss of property. Some even cost people their lives. The stories of five especially notable wrecks are briefly told here. with water, leaving her trapped and helpless. Lying on its side, the ship drifted in the lake for three days before a recovery party arrived to reclaim her body. When she heard them, she cried for help, but they didn't hear her. The party stuck a long pole into her cabin to probe for her corpse, but she didn't know what to do with it. Unaware that Mary was still alive, the search party left. Two days later, the ship's captain arrived to tow the vessel to port. When they got the ship turned upright, his aunt suddenly from her cabin exhausted but unharmed. She later retold her harrowing tale of surviving for five days, at times with only a small airspace at the top of her cabin. The only food she had was a cracker and an onion that she caught as it floated past. A mere three months after it was first launched, the three-masted Canadian schooner Manzanilla lost its captain when he was knocked overboard and subsequently drowned. After this tragedy, the ship experienced little trouble except running aground temporarily in 1879, but disaster struck in 1887. Headed to Toronto from Cleveland carrying black stone, the ship was hit by a single gale during the night. Captain George O'Brien struggled, but his efforts failed when the ship sprang a leak at Van Buren Point. All hands on board rowed safely to shore, but the captain remained on the ship. After clinging to the only part of the ship still afloat, he was rescued from the frigid waters by the Beecher nine hours later and brought six miles to safety in Dunkirk. Though it managed to stay afloat for almost 30 years, the Golden Fleece had more than its fair share of unfortunate events. In 1866, four years after it was built, two men fell overboard and lost their lives. Between 1866 and 1890 the ship was damaged on at least five occasions, ran aground three times, and collided with other vessels twice. Then, the Golden Fleece's luck ran out. Bound for Erie, Pennsylvania, from Buffalo on October 17, 1890, the schooner was driven ashore three miles west of Dunkirk, near the present-day state park. Although there were attempts to salvage the ship, it was finally lost when it was burned by arsonists in 1895. The service of the Helen Strong was cut abruptly short in late November 1846. As the steamship made its last journey over Lake Erie before winter settled in, a bad storm caused a steam pipe within the ship to burst. Without this pipe the ship lost all control, washed into a cliff, and began to break up on the rocks. One of the passengers scrambled off the ship, climbed upon an overhanging tree branch, and then sought help from neighboring houses. The desperate passengers were hauled up the cliff by rope. Only two souls of the more than 60 on board were lost. Built at the highly respected shipyard of Mason & Bidwell in 1862, the Passaic represented the changing technology of ship building from paddle-wheel steamers to those powered by propellers. After almost three decades on the water, where the ship experienced at least three collisions and ran aground five times, the Passaic finally reached its breaking point in early November 1891. It is assumed that the ship sprang a leak, causing the crew on board to pump feverishly to empty the boat of water. When that failed, the crew took refuge aboard the barge Hattie that the Passaic was towing. Oddly enough, the steamer did not sink, possibly because the lumber it was carrying helped keep it afloat. Instead, the boat drifted to Dunkirk where it was stranded broke into pieces, and could not be salvaged. Location. 42° 25.526′ N, 79° 26.027′ W. Marker is near Brocton, New York, in Chautauqua County. Marker can be reached from East Trail north of Traffic Circle, on the right when traveling west. Touch for map. Marker is in this post office area: Brocton NY 14716, United States of America. Touch for directions. Other nearby markers. At least 8 other markers are within 6 miles of this marker, measured as the crow flies. Brocton Arch (approx. 2.6 miles away); The First Exchange of Hostilities (approx. 5 miles away); The Site of the First Gas Well (approx. 5.2 miles away); Fredonia #1 (approx. 5.2 miles away); Abell Inn Site (approx. 5.3 miles away); Commander William B. Cushing (approx. 5.3 miles away); Dedicated to Veterans (approx. 5.3 miles away); Barker Common (approx. 5.3 miles away). More. 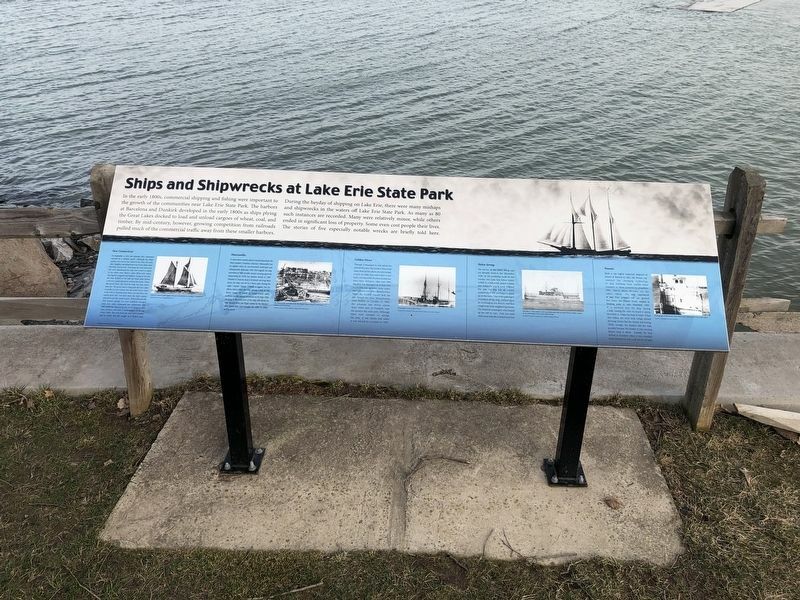 Search the internet for Ships and Shipwrecks at Lake Erie State Park. Credits. This page was last revised on April 15, 2019. This page originally submitted on April 15, 2019, by Devry Becker Jones of Washington, District of Columbia. This page has been viewed 43 times since then. Photos: 1, 2. submitted on April 15, 2019, by Devry Becker Jones of Washington, District of Columbia.